Interested in Renaissance literature, performativity, and embodied instructions? Excited about MLA in Seattle? Send in an abstract for this roundtable! 3/15 deadline for 200-word abstracts for 10-minute papers. I’m cooking up some linked conference sessions with Seth Williams and Jacque Wernimont on this topic so if MLA doesn’t work for you, stay tuned for more. This summer I tested recipes for braised beef, hot chocolate, marmalade, and seed cake in my sweltering Philadelphia kitchen. I was developing updated recipes for the First Chefs exhibition that opens at the Folger Shakespeare library later this month. My recipes will be available on recipe cards at the exhibition and I’ll also be giving a public lecture. I’m excited to share these recipes on Cooking in the Archives and the Shakespeare and Beyond blog in the coming months. This weekend I had the pleasure of convening the final plenary at the Rare Book School-sponsored Bibliography Among the Disciplines Conference in Philadelphia with András Kiséry. I’ve made this Storify of tweets from the session, but I also wanted to share my closing remark here. Critical bibliography is already committed to social justice and interdisciplinary work (to paraphrase a comment John Garcia made early in the conference). Now we need to figure out how to do this work. Panelists and community members reminded us this morning that through alliances, pedagogy, remix, irreverence, comparison in its successes and failures, attention to the individual object whether it’s a gathering of leaves or a gathering place like a club, and, most of all, enthusiasm we can make this work possible. The Storify includes far more points of view than I can capture from my scrawled moderator notes. The conference was also the culmination of over a year a work as a member of the planning committee and a session organizer. The incredible Rare Book School staff did a fabulous job making this event actually happen. Over the course of the conference I got to think about about transmission, paper machines, social justice, community, performance, ethnobibilography, fragments, and impossible books. In the sessions that I co-organized on “The Social Life of Books” and “Manuscript in the Age of Print,” I heard papers about kissing, wearing, and eating texts/books, and the hybridity of print and manuscript around the world. I got to brainstorming teaching strategies, comparing formats across cultures, and re-centering American book history around indigenous materials. A key takeaway was collaboration, whether data preservation or comparison or broadening or teaching is the goal. The conference was also a pivot point between two waves of Mellon fellowships that are administered through Rare Book School. If you’re curious, check out the new Society of Fellows page here. I’m excited for MLA Philly for a lot of reasons: friends are coming to town, I’m giving a paper on prophecy from my book manuscript, and I’m convening a roundtable connected to my research that’s part of the Presidential Theme, Boundary Conditions. If you’re attending the conference, check out the proposal and abstracts below and consider adding this roundtable to your schedule. Forged in the crucible of the London theater, the history play is a lasting creation of the early modern public stage. By reshaping the conventions of comedy and tragedy on the one hand, and historical writing on the other, history plays are dynamic explorations of the past crafted for the early modern moment. This roundtable will showcase new perspectives on the history play as it arose in the sixteenth century and continues to thrive in the twenty-first. The “returning” of this session’s title points both towards renewed interest in history plays, early modern and contemporary, in literary studies, as well as the act of returning to the past inherent in their very composition. The MLA 2017 Presidential Theme, “Boundary Conditions,” raises temporal as well as spatial concerns. As literary scholars, how do we negotiate between the past, present, and future of our texts? Furthermore, as new strains of historicism continue to inform literary studies, this roundtable’s interest in forms of historical temporality, commemoration, and affective connection offers rich directions for future study. In my remarks for “Returning to the History Play: Time, Affect, Memory,” I will discuss how playwrights in sixteenth- and seventeenth-century England used stories and plots drawn from historical sources to unsettle inevitability, and to foreground instead the contingency that their fictions were able to produce. In particular, I consider critical approaches to Shakespeare’s history and Roman plays to argue that the familiar material the playwright often reshaped occasioned meditations on both narrative forms and fiction’s access to alternative outcomes. His historically-inflected material offered a vantage on imagined futures that were remarkable not for their ambition, but for their flexibility. Indeed, references to such futures also enabled the contemplation of emotional rewards articulated on personal, rather than national, terms. I argue that, in a period in which imaginative writing invents new ways of conceptualizing and interpreting time, Shakespeare’s interventions in the past regularly require his audience to imagine different paradigms by which they might approach their own ethical decisions and actions in the present. In these plays, it is the process of contending with contingency that defines ethical activity; when familiar historical material skews and rattles dependable temporal paradigms, what is prompted instead implicates (and makes demands upon) the audience’s judgment. In this way, early modern plays concerned with historical thinking prompt new options for exploring alternative outcomes and contingent futures. Literary critics have conventionally described Shakespeare’s English history plays as nostalgic for a lost heroic past that stubbornly eludes dramatic recuperation. In this line of thinking, Shakespeare’s histories cannot help dramatizing their own failure to return the dead to us, offering in their place pageants of similitude that expose the discrepancy between theatrical representation and the thing itself. In this paper, I turn to recent insights from performance and photographic theory to suggest the incompleteness of these assumptions about the temporality of historical representation. I contextualize the histories among transhistorical visual arts by which humans create and look at effigies of the past, suggesting how forms like historical reenactment, photography, and visual art resist linear temporality by positing the dead as conscious audiences and performative surrogates for the living. To illustrate briefly the shared phenomenology of these forms, my paper introduces Jeff Wall’s staged 1992 photograph, Dead Troops Talk, as a conceptual frame for exploring how the dead can be translated into sites of potential—into material for creating what is yet possible and imagining a future that is perpetually deferred. I then turn to two scenes from Shakespeare’s 1 Henry VI, the funerals of Henry V and the Earl of Salisbury, to show how survivors stage elaborate performances for the dead, whose silent but obdurate presence generates current and future action. In both Wall’s photograph and 1 Henry VI, I argue, dead soldiers are translated into sites of layered performance that complicate strict linear time. The concept of affective entanglement offers an alternative to the conventional understanding of political agency as a property enjoyed by aristocratic individuals who mobilize their intellectual, emotional, and material resources in schemes to acquire or consolidate power (think of Shakespeare’s Richard III). In Politics of Affect, Brian Massumi attempts to dispel some “oft-repeated misconceptions about affect and its political implications,” including the belief that “affect is asocial.” Instead, Massumi insists that affect, “as the openness to being affected, is directly relational”; in fact, it is “pure sociality, in the sense of the social in the openness of its incipiency, ready to become all manner of social forms and contents.” Because, for Massumi, affect is a force of transindividual relationality and change, it operates inescapably in the political arena. Building on Massumi’s framework, I argue that an understanding of affect as “the ongoing force of the social taking evolving form” allows us to conceive of political agency in the early modern history play beyond the conventional understanding of agency as the intentional expression of an aristocratic subject. Rather, the affective entanglements among aristocrats and commoners, as well among monarchs and subjects, constitute emerging events through which participants can generate political knowledge and make an impact on their world. My analysis of affective encounters in the early modern history play will address the different forms of agency made available by the unfolding temporality of political process. A generation of British playwrights (Hare, Bond, Brenton, Wesker, Barker, Arden, and others) used the history play to redefine the political nation in the wake of World War II, the early years of Labor activism, and the waning of Labor pre-eminence and the rise of Margaret Thatcher. In doing so, they implicitly and often explicitly worked both within and against the terms of the history play established by Shakespeare, often violently rejected what they say as his elitist class politics and imperialist marginalization of those from the Celtic fringe. This paper will examine several plays, probably Howard Barker’s The Romans in Britain, Edward Bond’s Bingo, or Howard Barker’s Victory to show how the figure of Shakespeare, the Shakespearean history play, and the politics of seventeenth-century England inform their vision of post-World War II Britain. The history play, from its Elizabethan roots to the present, has always sat at a crossroads of epistemological and political concerns, and this intersection has itself always been framed by a nagging question about the nature of its entertainment value. What is the pleasure of performing the past? In the case of a recent phenomenon like Hamilton, an experience bathed in the power of its charismatic performers and invigorating music and dance numbers, the answer is obvious. But what motivates playwrights and draws audiences to the imagined past on stage is more often enigmatic. Moira Buffini’s 2013 play Handbagged raises this question especially in regards to its self-conscious didacticism. The play depicts the private meetings held between Queen Elizabeth II and Prime Minister Margaret Thatcher, from Thatcher’s historic ascension in 1979 to her ouster in 1990. The play covers the major topics one might expect: the miners’ strike, the Falklands War, the Cold War, Thatcher and Ronald Reagan, Thatcherite economic policy, and her often inflammatory rhetoric about society. What is unexpected is the unusually dialectical form the play takes. Present on stage throughout are four actors that portray younger and older versions of the Queen and Thatcher; the older selves frequently chide the younger ones by claiming that this or that thing never really happened or never was said, foregrounding questions of truth, memory, and the knowability of history. In a persistent set of “meta” comments, the characters also express anxiety that their supposed millennial audience won’t understand the references to Thatcher-era people and events, prompting a series of mini-lectures on the 1980s. In this paper, I want to query what motivates these explicitly didactic moments in the play, and to consider what they tell us about the anxieties, aesthetics, and assumptions that surround the staging of history today. Click to read the full symposium program. 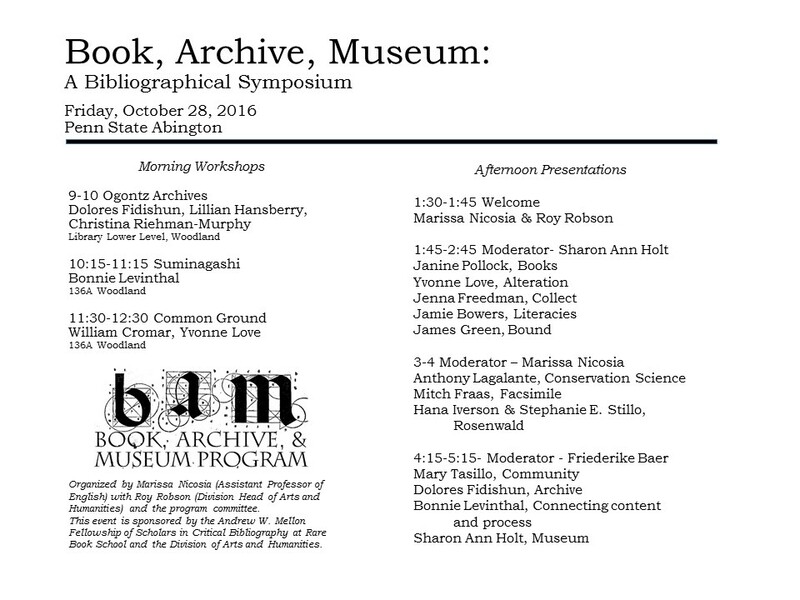 Last Friday I convened a symposium at Penn State Abington called “Book, Archive, Museum.” Inspired by a new curricular program we’re developing on campus, I invited students, faculty, staff, and guests to participate in a day-long conversation about these keywords. I’ve decided to share a version of my opening remarks and some further reflections here today before the vital ideas and questions raised at the event slip away from me. This event was sponsored by The Andrew W. Mellon Fellowship of Scholars in Critical Bibliography at Rare Book School with additional support from the Division of Arts and Humanities. We are here today to have a conversation about the art of the printed word, broadly conceived through our program keywords – book, archive, museum – and the keyword presentations we will hear this afternoon. I suggested convening a brainstorming event like this one because of many conversations I’ve had over the last few years as a member of the Andrew W. Mellon Fellowship of Scholars in Critical Bibliography at Rare Book School. I know that these words – book, archive, museum – mean very different things to people from different disciplines and professions. As a scholar of early modern English literature, I think about hand-press books, the circulation of works in London book trade, and the dynamics relationship between print and manuscript in the era. When I organized my first RBS-Mellon symposium called “What is a Book?” at Scripps College in 2015, I heard papers about digital poetry, the process of making artists books, and the communities engaged by a Hedwig and the Angry Inch fan zine. These are diverse, but connected, modes of thinking about the art of the printed word. I know from conversations with Classicists working on epigraphs and Art Historians studying paintings on paper that these terms mean different things in different disciplines. I read tweets from archivists working on materials from the Ferguson protests and the Occupy movement on the one hand, and family papers on the other, and see that they face interconnected, but distinct challenges. Admittedly, I know less about museums, but I do know that curators and conservators strive to maintain the safety and stability of their objects while presenting them in meaningful ways and crafting compelling narratives. If I asked each of you to define book, archive, or museum, I suspect that a map of overlapping definitions would emerge, rather than neat, codified, or consistent answers. This afternoon I hope we will make that map together, because, I trust, the map and the process of mapping will inflect the design and implementation of the Book, Archive & Museum Program. Over the course of the day, a map of overlapping interests and definitions did emerge. During the morning workshops, I watched my students learn about the Ogontz Archives held on our campus for the first time by handling rare material and listening to our expert librarians. 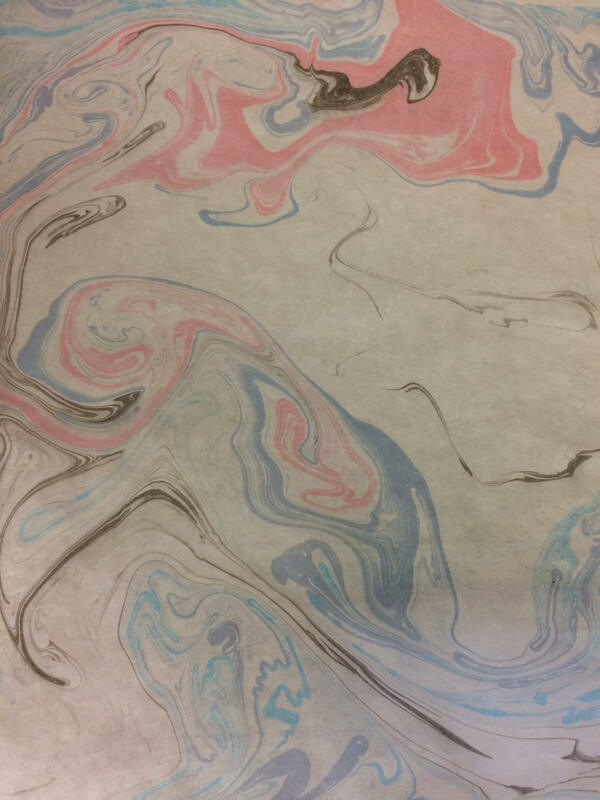 Standing in front of a shallow tray of water, my colleagues became playful and giddy as they practiced the Suminagashi paper-marbling method and suspended colorful inks on the fluid surface (example below). Friends and colleagues that I’ve known for ages, or only a short while, participated in interdisciplinary dialogues about sewing kits, herb-slicers, cigarette cases, and other objects as we sat on stools in the art studio. We all found common ground. A number of the short, keyword papers in the afternoon sessions challenged accepted definitions of books and archives: what does it mean when something is bound? when literacy is taught in a kitchen? when treasured books reside in a public library that provides so many other essential services? when facsimiles — in the book and museum worlds — trouble any definition of the “original”? when archives bear witness to exclusion, prejudice, and privilege? when the boundaries of the book or the page are challenged by artistic processes, alteration, and emendation? Moreover, even when we’ve acknowledged these messy parameters, what do we make of the materials we have at hand? how do we (as scholars, librarians, conservators, public historians) conserve, curate, and provide access? how to we avoid replicating the structural disparities of our culture as we tell the stories of our objects? From chemistry curricula to germolata, zines to an overview of the Rosenwald collection at the Library of Congress, we shared expertise. We also considered the different ways these questions might engage our campus and the broader community of the greater Philadelphia area. From class activities to chance encounters, how do we encourage students, colleagues, and community members to think about making, interpreting, and handling books? how to we bring people into archives and museums and/or encourage them to see these spaces as sites for research and storytelling? how do we cultivate chance encounters on the one hand and deepen specialized expertise on the other? My colleagues and I have a lot of thinking to do.